Yeti/RTIC Cooler lock bracket made of STAINLESS STEEL by SinBinShop.com at Kerinci. MPN: 637405165487. Hurry! Limited time offer. Offer valid only while supplies last. HIGH GRADE AND QUALITY 316L brushed laser cut Stainless Steel locking bracket with a 9/16'' (round hole) for bigger locks and plenty of wiggle room! HIGH GRADE AND QUALITY 316L brushed laser cut Stainless Steel locking bracket with a 9/16" (round hole) for bigger locks and plenty of wiggle room! Fits All YETI Mid to Large Size Coolers (WILL NOT FIT ROADIE 20 AND ANY OTHER SIMILAR COOLERS) RTIC Coolers, Igloo 55 Quart Sportsman Ice Chest Cooler, Grizzly Coolers and any other cooler with a 1 1/4'' tie down slot in the flange for locking and mounting purposes. The bracket is 1 3/16'' width it fits better and snug in the cooler slot. Its top hook bend helps it grip the slot so it does not fallout or wiggle on the cooler. 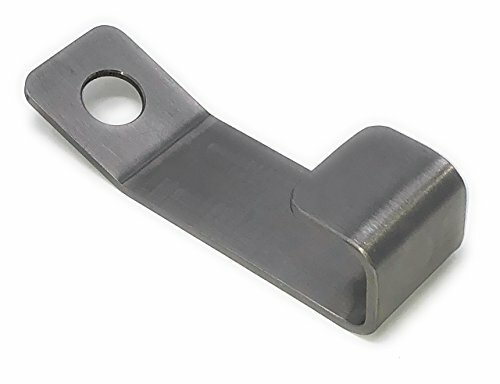 This bracket is cut from 10 gauge 316L Stainless Steel 1/8" thick material which is thicker and stronger then other metals. Made from 316L (Ultra-Low carbon steel) will never rust! 316L has a very high corrosion resistance in many environments. Stainless Steel 316L works very well against corrosion in various atmospheric environment's. NO other metals should be used with the Yeti Cooler or can hold up like 316L Stainless Steel. This locking bracket is made from high grade metal just as your Yeti Cooler is made from the best materials that puts it ahead of the competition. If you want to feel more secure about your investment purchase a bracket that will hold up to your lifestyle! The bracket is 1 3/16'' width it fit better and snug in the cooler slot. No Lock or cable is provided! MADE IN THE USA !!! LIFE TIME WARRANTY !!! If you have any questions about this product by SinBinShop.com, contact us by completing and submitting the form below. If you are looking for a specif part number, please include it with your message.